Spence Trail Building is Complete for 2018. 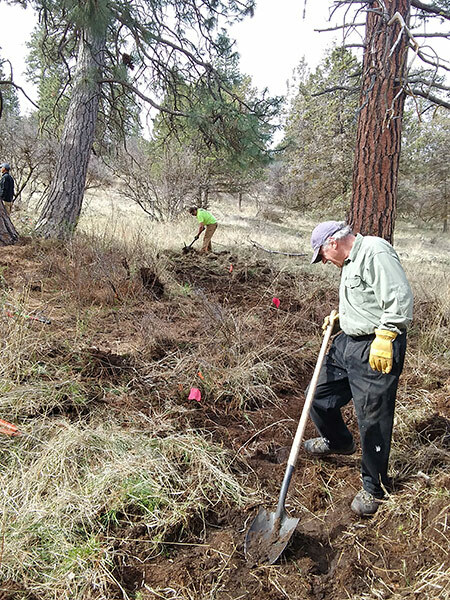 Spence Mountain now has about 11 miles of new trail in the central portion of the tract – most easily accessible from Shoalwater Bay TH. The official opening is on Jun 2 with a 30k/50k run scheduled. The trails are rideable at present but the signage is lacking – will be working on that soon though as some of the posts are already up. Updated maps are available on the maps page. 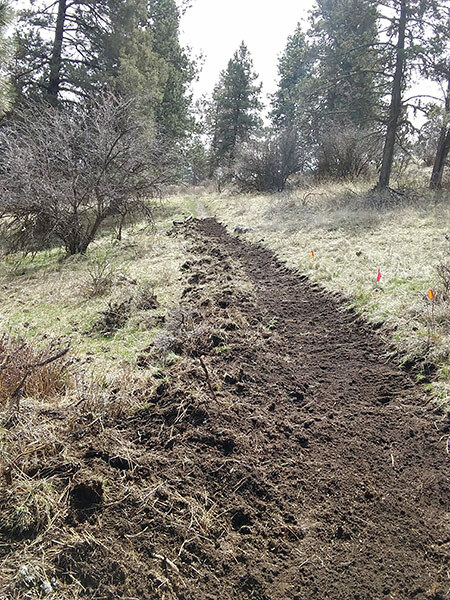 The new trails at Spence Mountain are coming along nicely and are getting close to finished. The lower part of Captain Jack is pretty much completed. Modoc is about 95% complete as of yesterday. Winema is completed. The upper part of Captain Jack is being constructed as we speak. These are anticipated to be open by the end of the month. We have also started putting up signposts for these trails with temporary signs likely coming soon. There will be close to 11 miles of new trails that will add a lot of options and variety to Spence Mountain. There is a work group scheduled at Spence Mountain for 5/12/18 at 8:15 AM at the Shoalwater Bay TH. The plan is to rake and clear roots from the currently being built Modoc Trail. After the work is completed you can ride the newly opened Old Eagle and Shoalwater Trails – a loop of about 4.5 miles. Come out and help build and ride a new trail (and join our Meetup group linked below). Went up to Spence Mountain yesterday for a ride around the new trails. As of today, Old eagle – the trail going north and east from the Shoalwater Bay TH is open. It is about 1.6 miles long and terminates where it crosses Eagle Ridge Rd and connects to the eastern half of Shoalwater Tr. The eastern half of Shoalwater Tr is still being groomed but should be open next week some time. The western half of Shoalwater Tr is now open (about 1.4 mi in length). This trail starts across Eagle Ride Rd from the Shoalwater Bay TH (next to the exit of North Ridge Tr). The lower 2/3 of Captain Jack Tr is machine built and still needs a lot of hand grooming. Machine work on Modoc and a short portion of Winema is continuing (hopefully done soon). So, there are about 3 miles of new green trail open for use with the other trails coming along nicely. I rode the new trails at Spence today to see what had been done. At present Old Eagle should be completed by the end of today (not sure if it will be open yet). The eastern half of Shoalwater is rough cut, but not finished. The western portion of Shoalwater is pretty much complete, but not currently open. Rode up to Captain Jack and found them actively digging. By report, at least half of the lower section has been rough cut – expected to be completely cut in the next week. They are also actively cutting trail on Modoc, but I think that is less complete than Captain Jack. I updated the maps on this website to reflect the work that has been done. hopefully the Shoalwater/Old Eagle loop will be open soon. The trails are drying out! The trails in Moore Park and at Spence Mountain are quickly drying out and becoming rideable. Most of the muddy spots in Moore Park are merely moist now and not muddy and available for riding, walking, and running. Spence mountain is also improving. The lower half of South Ridge Tr is almost completely snow free and rideable. The upper half of South Ridge Tr has snow patches, but nothing terribly large or deep. I rode up to Jct 2 on South Ridge on the weekend without too much trouble. I didn’t ride the upper half of Hooligan Tr as it likely still has snow on it (north and west face of the mountain), but the lower half is good to go. We are doing work on the east end of Hayride Tr in Moore Park. We plan on a couple of reroutes to decrease the grade of a couple areas of the trail. Work is planned for 9 AM on Friday 3/30. Park at the northern Eulalona trailhead just above the frisbee golf course in the park. Bring yourself, water, snacks, and clothes appropriate for digging in the dirt. We will supply the tools. This page will be for news items or other useful information about upcoming events, trail conditions, work groups and whatever else I can think of. Currently the trail riding is kind of bleak as the trails are almost all muddy, but the advent of warmer and dryer weather should help improve that situation. I am looking forward to riding the trails in the park and especially the 10 miles of new trail that are currently being created at Spence Mountain. Stay tuned for details as they come up.